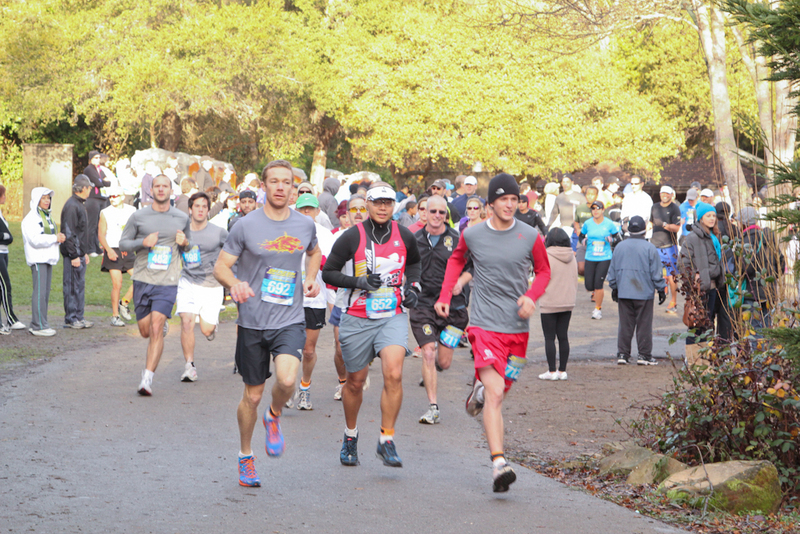 On New Years weekend I spent my mornings at Lake Chabot Regional Park for back to back new years races. I participated in the New Years Day race at the park on January 2, 2011 (See New Years Race for 2011 post) and was planning on doing the race again on 2012 but in the months leading up to the race I saw that the race organizer (Brazen Racing) was also going to have a New Years Eve race. It was a perfect year to do this since New Years Eve fell on a Saturday and New Years Day on a Sunday. What better days to do back to back races. 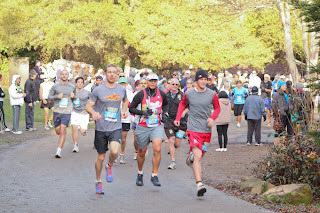 I was intrigued but wasn't completely convinced about doing back to back races, both at Lake Chabot. Then Brazen announced a special double medal for those participating in both races. At first I thought it would only be for those competing in the half marathon distances both days but like their other race medals they announced that the double medal would go to all who participated in both races, regardless of the distance. This really interested me so now it was just deciding which distance to run. I have really only done a couple of trail races and haven't done much trail running (although it is one of my goals for 2012) so I knew I didn't want to do the half marathons. I decided to do the 10k for New Years Eve and the 5k for New Years Day and managed to convince one of my family members to do the same. Actually I think it was the double medal that convinced him. As with other Brazen races the entry fee depends on how early you register and varies by distance. I registered a few weeks before the races and paid $34 for the 10k and $29 for the 5k. If I had chosen to get race shirts then I would have paid $5 more for each race. Brazen gives the option of deducting $5 from the race fee if you select to not have a t-shirt or paying an additional $6 to get a technical fabric race shirt. Another nice thing about the back to back races is that those competing in the the half marathons on both days ran the same course but in opposite directions. So they ran it counterclockwise on New Years Eve and clockwise on New Years Day. The 5k and 10k courses were the same on both days. Start times were a bit later than usual, which I don't think people minded since it was the holiday weekend. The half marathon started at 8:30am, the 10k at 8:55am and the 5k at 9:05am. Parking fee for Lake Chabot is $5 for the main paved lot and a dirt lot. There is also plenty of street parking just outside of the park on Lake Chabot Road. We got there early enough on both days to park in the paved lot. From the paved lot it was a short walk to the race but some of those who parked on the street had quite a walk. Bib pick-up was easy and was organized into race distances and alphabetical order. They also had course maps to take with you that also reflected the course distances. With it being trail races the distance was not exact, for example the 10k distance was 6.48 miles and the 5k was 3.3 miles. Next stop was to pick up the timing chip, then goodie bag, then race shirt if you ordered one. There were park bathrooms available for use just as last year but this year there were also additional porta potties available. The additional porta potties was a good idea since there were a lot of people, especially for the sold out New Years Eve races.